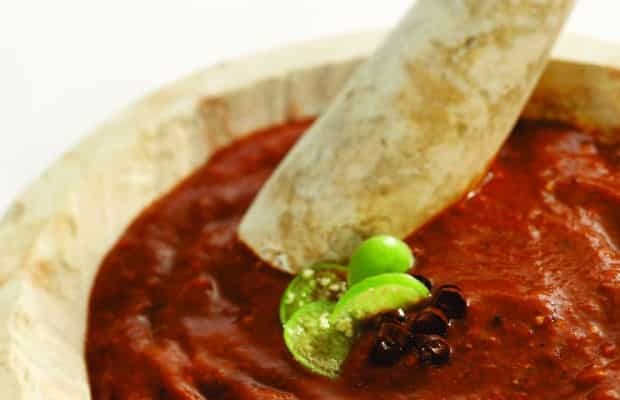 This sauce is one of the favorites in the Mexico City. Its deep red color makes it very striking, besides being very tasty; It is required to accompany a sauce tacos al pastor This is the one that is always next to taquero Slicing meat to make tacos. ; It is a secret recipe, which Mexicans seek not to share. All fans of tacos know that the success of a taco is in the sauce. Chili de Arbol sauce is made by many companies produce commercially under the name "taquera sauce" but its not the same as home made. soak guajillo chiles in water for 10 minutes to hydrate, then remove stem and seeds. Place in blender with garlic and onions. Add fried chiles to blender and blend until smooth. Blend and taste before you add to many chile's de arbol.